LOS ANGELES (AP) — The heart of Yosemite National Park, where throngs of tourists are awe-struck by cascading waterfalls and towering granite features like El Capitan and Half Dome, will be closed as firefighters try to corral a huge wildfire just to the west that has cast a smoky pall and threatened the park’s forest, officials said Tuesday. Yosemite Valley will be closed for at least four days beginning at noon Wednesday, along with a winding, mountainous, 20-mile (32-kilometer) stretch of State Route 41, park spokesman Scott Gediman said. At least a thousand campground and hotel bookings will be canceled — to say nothing of the impact on day visitors, park workers and small businesses along the highway, Gediman said. Rangers were going to campsites one at a time to inform visitors of the closures. Hotels guests were getting phone calls and notes on their doors. Officials were quick to point out that Yosemite wasn’t under imminent danger from the Ferguson Fire. Authorities decided on the closure to allow crews to perform protective measures such as burning away brush along roadways without having to deal with traffic in the park that welcomes 4 million visitors annually. Yosemite Valley is the centerpiece of the visitor experience, offering views of landmarks such as Half Dome, Sentinel Dome, Bridal Veil Fall, El Capitan and Yosemite Falls. The glacial valley’s grand vista of waterfalls and shear granite faces has been obscured by a choking haze of smoke from the Ferguson Fire. Over nearly two weeks, flames have churned through more than 57 square miles (148 square kilometers) of timber in steep terrain of the Sierra Nevada just west of the park. The fire was just 25 percent contained Tuesday morning. 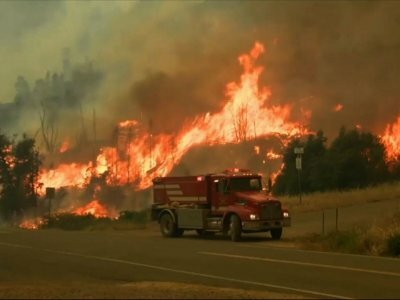 In the state’s far north, a nearly 4-square-mile (10-square-kilometer) wildfire has forced the evacuation of French Gulch, a small Shasta County community that dates to the Gold Rush.